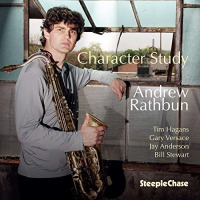 Andrew Rathbun is a Canadian-born tenor saxophonist resident in New York, a Brooklyn regular who has garnered support from fellow tenorists Joe Lovano and Dave Liebman as well as trumpeter Kenny Wheeler. That should give some sense of Rathbun's lineage. He's a thoughtful player andtrue to the influence of Wheeler (and Booker Little) and the mid-'60s Miles Davis quinteta skillful composer, honing a refined lyricism that explores challenging harmonic patterns. He`s also interested in consistent partnerships. 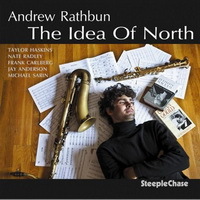 The quintet heard here includes two musicians, trumpeter Taylor Haskins and bassist John Hebert, who played on Rathbun's first quintet session, Scatter Some Stones (Challenge, 1998). 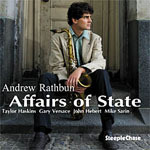 Returning the favor, Rathbun has also appeared on Haskins' two Fresh Sound CDs. As one might expect, there's a close-knit feeling that extends from hand-in-glove ensemble playing to some understated contrapuntal improvising. 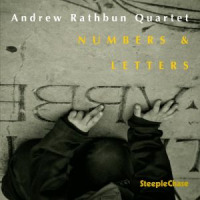 Rathbun likes extra-musical themes (two of his previous CDs have been poetry settings), and the pieces here reference the decline of America in the Bush years, from the Iraq war to collapsing infrastructure and luxury condos; however, the album's dominant moods are melancholy and resilience rather than rage, an introspective lyricism that wouldn't otherwise suggest the political theme. 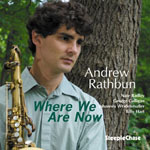 Rathbun's compositions use contrasting elements to create tension and develop texture, as in the antiphonal voicings of "Fragmented," the dissonant elegy of "We Have Nothing But Tears" and the effective use of sparkling electric piano on "Folly." His tenor sound possesses significant flexibility, from warm calm to gritty resistance; it's a fine match with Haskins, whose pitch inflections can add a sudden illumination. The rhythm sectionHerbert joined by pianist Gary Versace and drummer Mike Sarinis a model of support, a loose and engaged presence balancing empathy and aggression with an almost orchestral breadth. The result is consistently thoughtful, well-crafted music in a mature idiom. Track Listing: Fragmented; We Have Nothing But Tears; Around the Same Circles, Again and Again; Break the Chains; 5th Anniversary; Fiasco; Ongoing; Folly (of the Future Fallen); Paint Peelings. 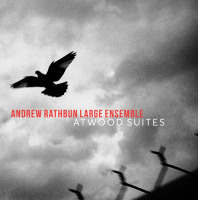 Personnel: Andrew Rathbun: tenor saxophone; Taylor Haskins: trumpet; Gary Versace: piano; John Hebert: bass; Mike Sarin: drums.